Kesten studied music, with a concentration in experimental music, at UdK Berlin. He has been commissioned by ensembles such as Object Collection New York, Rue du Nord Lausanne, Solistenensemble Kaleidoskop Berlin, We Spoke London a. o. and realized full-evening’s pieces in spaces such as Radialsystem V Berlin, Schauspielhaus Wuppertal, Théâtre 2.21 Lausanne and Ontological Experimental Series New York, among others. He has also created site-specific works at Museum for Modern Art MUMOK Vienna and delivered solo performances in Europe, North America, and Japan. Kesten has received awards and grants by the Civitella Ranieri Foundation, the Berlin Cultural Senate, Ernst-von-Siemens-Musikstiftung, International Society of New Music, Kuenstlerhaus Lukas Ahrenshoop, Villa Aurora Los Angeles. Kesten is a member of the ensemble Maulwerker and artistic director of the series ‘maulwerker performing music’. He co-curates the concert series ‘Labor Sonor’, and the LABOR SONOR festivals, ‘TRANSLATING MUSIC’ (2015), ‘MOVING MUSIC. choreographers compose for musicians.’ (2016) and ‘CHOREOGRAPHING SOUND. musicians compose for dancers. dancers performing music.’ (2018). Teaching positions and guest lectures in Europe, Israel, North and South America. 2018 – Arbeitsstipendium [Working Grant] of the Berlin Cultural Senate. 2016 – Civitella Ranieri Music Fellowship, Umbria/ Italy. 2015 – Arbeitsstipendium [Working Grant] of the Berlin Cultural Senate. 2014 – One-month residency at Künstlerhaus Lukas Ahrenshoop. 2012 – Commission by Ernst-von-Siemens-Musikstiftung for Untitled #5 for five voices, 16', premiered by ensemble Maulwerker at festival Randfestspiele Zepernick. 2011 – Commission by IGNM, WIM and Dampfzentrale Berne, Switzerland for untitled (placing in space) for violin, soprano saxophone, accordion, 45’, Festival MIKROTON, Dampfzentrale Berne, October 2011. 2010 – Commission by Association Rue du Nord Lausanne for des champs sans noms for clarinet, clarinet/ bass clarinet, pocket trumpet/ banjo/ electronics, accordion, percussion, turntable/ violin, contrabass/ walkie-talkies, 75’, ensemble Rue du Nord, Théâtre 2.21, Lausanne, October 2010. 2008 – First prize of Zeitgenössische Oper Berlin's interdisciplinary competition operare08 (funded by Kulturstiftung des Bundes) with the artists group antenne pernot to realize WÜSTE WÜSTE. 2008 – Commission by Ontological-Hysteric Theatre New York for THE ROOM, ensemble Object Collection, March 2008. 2007 – Guest grant for a one-month residency at Villa Aurora Los Angeles. 2002 – Residency with the production collective FERNWÄRME at Schloss Bröllin. 2000 – Grant of Stiftung Kulturfonds for a one-month residency at Künstlerhaus Lukas Ahrenshoop. 1997/98 – Commission by the Berlin Cultural Senate for parochial. 1990 – Three-month residency at 'Ateliers im Alten Schlachthof' Sigmaringen. Festival "grenzenlos. Berlin in Moskau" Mossovet-Theater Moscow 1996. His works have been broadcasted by radio stations in Germany, the Netherlands, the U.S.A. and Canada. • „Variationen für Kontrabass. Hommage à Benjamin Patterson“, in: Benjamin Patterson SNEAK REVIEW. Catalogue, ed. by Petra Stegmann, Berlin/Potsdam 2014. • „LAUGH 1, LAUGH 2, LAUGH 3“, in: RIRE LAUGH LACHEN. Antonia Baehr, ed. by Les Laboratoires d’Aubervilliers, France, 2008. • „unter umständen verabschieden wir uns behalten etwas in erinnerung was wesentlicher erscheint als das gegenwärtige fragen aber nicht mehr“, in: Tools of the Mind, ed. by Matt Marble, Oregon 2007. – in connection by the exhibition „Usufruct“, curated by Seth Nehil, 7-30 November, 2007, Linfield College, McMinneville, Oregon, in which the score of the piece was exhibited. He studied at the Universität der Künste Berlin (music: guitar, piano, voice; counterpoint/twelvetone-technique with H.Fladt; musicological thesis on 'Silence in the work of John Cage and Morton Feldman'; Experimental music and music-theatre with Dieter Schnebel; Performance art; Projects with the stage design class of Achim Freyer; classes with Ernest Berk, Joan Jonas, Anna Triebel) and TU Berlin (German literature and linguistics). Studied 'Zen-Arts' (overtone singing, vocal improvisation, calligraphy/notation etc.) with Michael Vetter. Movement studies with various teachers (Paul Loomans, Maya Brosch, Yoshi Oida, Monika Pagneux, Amos Hetz a.o.). His interest lies in the "space in-between": between music and theatre, music and language, between music and the visual arts. For example: ja es ist plötzlich wärmer geworden (2003), music theatre, a collaboration with Steffi Weismann. His pieces work with the space which opens up between the sound of language and the parallel, non-illustrative action (-cycling 1990; des Kleinen Übergewicht 1995, 45 seconds 2006). They make use of everyday spaces and their sounds, including works made for train stations, in which minimal sounds of winds and brass are spread over the station and mixed with sounds of trains and passers-by (nordbahnhof 1996, bahnhof westend 1996, bahnhof zoo 1997). willkommen zu hause / welcome home is written for the squeaking doors of the Nordbahnhof station in Berlin and two violins which mirror the door sounds: the passers-by experience the music while on the move. In (o.T.) für klarinette in einem raum mit langem nachhall 1 (1999) and (o.T.) … 2 (2000) [(without title) for clarinet in a space with a long echo] the clarinet plays to its own echo as a second voice, microtonally, and thus refers to the presence of space. parochial (1998) – for the group "Die Maulwerker" (4 female voices, trumpet/voice, clarinet/voice, alto saxophone + additional instruments) – was written especially for the Parochialkirche Berlin: sculptural shaped sounds are moved in space, while trumpet, clarinet and sax move mostly outside the space and so extending acoustic perception beyond the walls of the church. 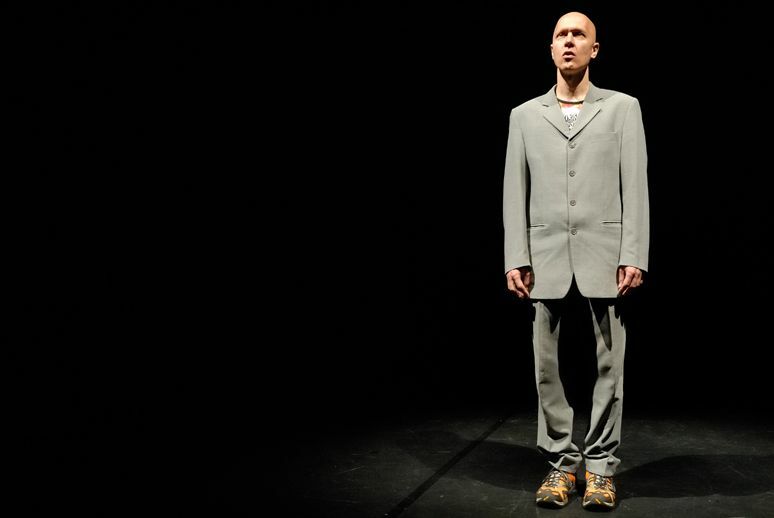 zunge lösen [releasing tongue] (solo version 1999/ ensemble version 2001/ trio version 2002) - for tongue and breath - works with the root of articulation and is both a work for voice and a scenic composition, music-theatre in a compact form. His recent works unter umständen verabschieden wir uns behalten etwas in erinnerung was wesentlicher erscheint als das gegenwärtige fragen aber nicht mehr [possibly we take leave keep remembering something which seems more essential than the present but don't ask anymore] (2004) for water, paper, voice; tongue, breath, larynx; trumpet (trio) and o.T. (atem, zunge, etwas kehlkopf) [without title (breath, tongue, some larynx)] (2005) for voice solo analyze the vocal production and understand breath, tongue and larynx as separate layers in 'counterpoint'.